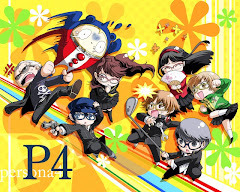 (+) Pros: - Bigger world to explore with brand new enemies and bosses, - Reworked gameplay mechanics make the game feel fresh, - Covenants have a bigger impact on the game now, - More bosses than in any of the previous games, - New interface and UI makes the game a lot easier to play, - Bosses are quite varied, and optional bosses are a lot tougher, - More content overall than the original. (-) Cons: - Drangleic has a lot less lore than Lordran. So its been awhile, hasn't it? It took "From Software" awhile, but its finally here...."Dark Souls II". 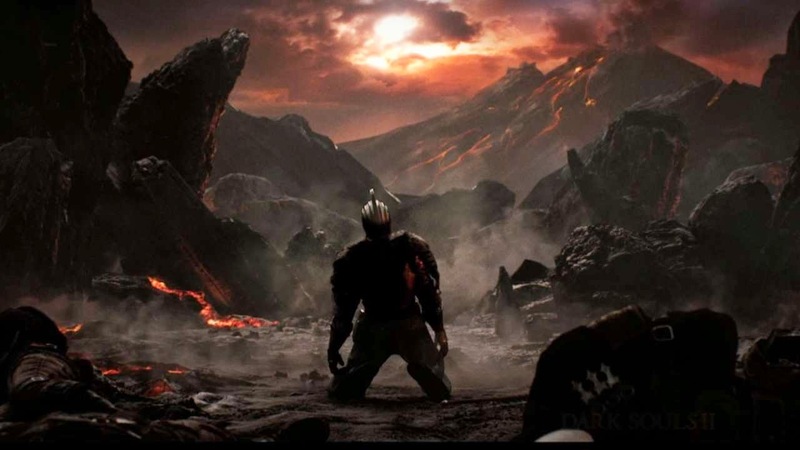 As if the countless dying in the world of Lordran wasn't enough, "From Software" has presented the fans of the franchise another journey into the depths of hell, where nothing but death awaits. I was honestly not too excited about "Dark Souls II", with the changes to the development team and all, I was honestly a little worried. That was, until I finally laid my hands on the game....then I realized that my worrying was all for naught. 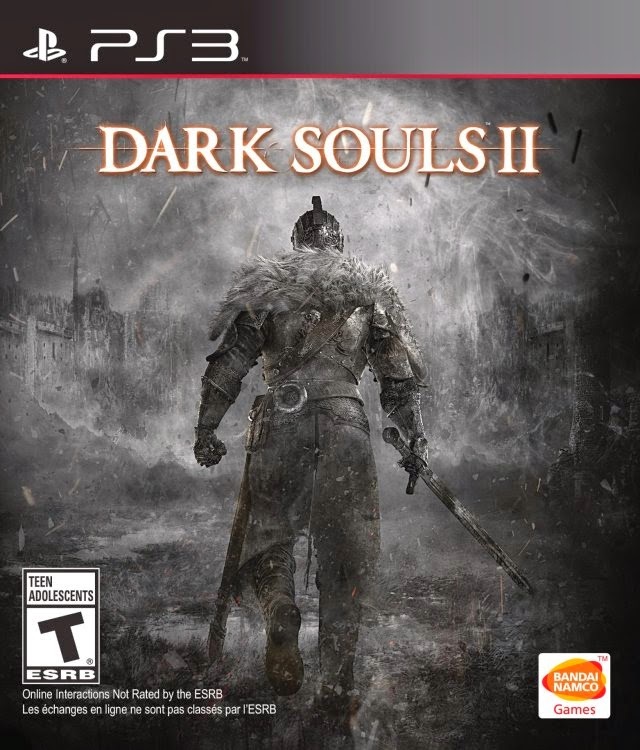 "Dark Souls II" is a terrific journey through a torn world, where monsters and many other evils lurk in every corner. While it might seem a little bit familiar at times, your journey through Drangleic will be a memorable one. Just be prepared to die, a lot. 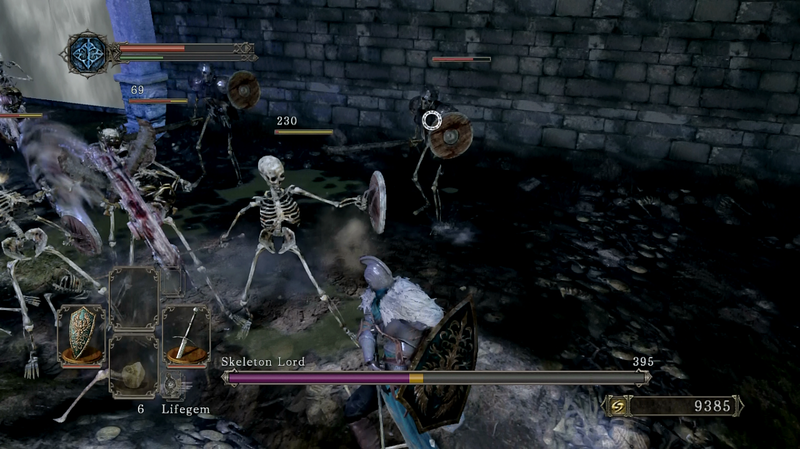 "Dark Souls II" is a joy of a game. If you aren't familiar with the game play by now, I'll summarize it quickly for you. The game by itself is an open world exploration experience. You go from area to area, discovering new ones, each separated by fog gates. The world is filled with many unspeakable horrors, be it hollowed soldiers or stray monsters. And at the end of most areas, you'll face bosses, demons with inexplicably larger souls, that'll grant you more power. As with previous games, everything you do in the game requires souls, from leveling up to purchasing spells or items. How do you get souls? 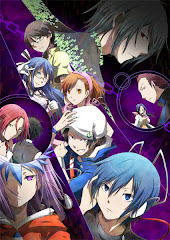 By defeating bosses and enemies. Game play is very simple, you are given to equipment slots, one for your left hand and one for your right. You hold weapons and shields, with L1 and R1 (or LT and RT for Xbox), you can use the corresponding equipment on the hand, be it attacking with a weapon or blocking with a shield. You can roll to dodge enemy attacks, and most enemies are struck down close range. Of course, different attack styles garner different types of attacks. Bows shoot from afar, staves cast a variety of spells, etc etc. As you get souls, you can level up, adding different statistics to get stronger, to wield different weapons and use multiple styles of fighting. Because you can literally build anything (be it a mage with a greatsword or a warrior with a bow), the game has high replay-ability, like that of its predecessors. Aaand...you're dead, thanks very much. As with "Dark Souls" before it, "Dark Souls II" has a massive world that is intriguing to explore. From the grand Drangleic Castle to the daunting Black Gulch, there isn't a shortage of interesting areas for you to discover, each with its own enemies and bosses. Each area feels fresh, and while some bear great similarities to areas from previous games, they are still a blast to run through. The feeling of anticipation before encountering a new boss or the feeling of intrigue when you step into a brand new area...all of these are still part of the core "Dark Souls II" experience. Of course, who can forget the thrill of knowing that you'll die another 50 times or so in this new area...its all too familiar. Another thing that makes the game feel fresh is that they tweaked the gameplay mechanics. While it might not seem to be too big of a change, it really changes the way the game is played. For one, the game feels slowed down. While attacking and rolling by themselves remain mostly the same, there is a slight delay between actions now, making you feel like every move you make is important...which is in this game. The old strategies of hitting a boss and immediately rolling away won't necessarily work now, since the delay exists. Drinking estus flasks are also slower, and your health recovers slower as well. The way many weapons work now are also different, so its wise to remove all knowledge you used to have about attack styles. To smash faces with rats...not very exciting don't you think? 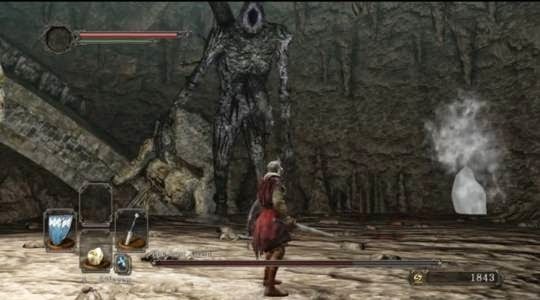 What's "Dark Souls" without its bosses? 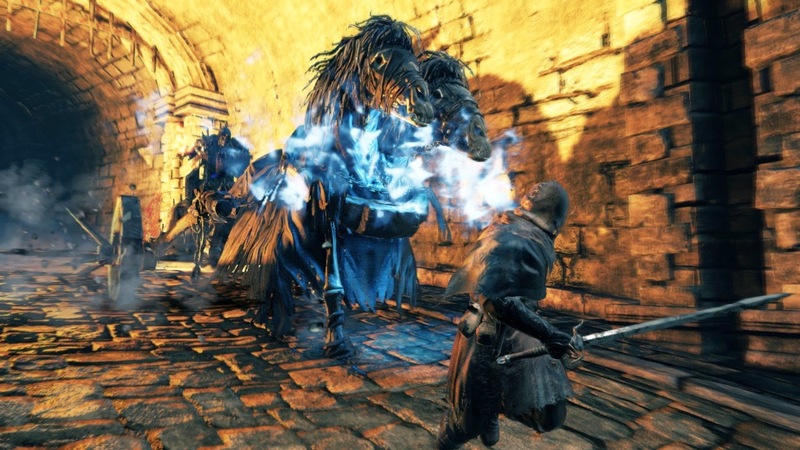 In "Dark Souls II", there are more bosses than in any of the previous games in the franchise. That goes without saying that you'll be dying a lot more, but as usual, the pleasure of discovering new bosses, dying to them, and then finally defeating them remains. 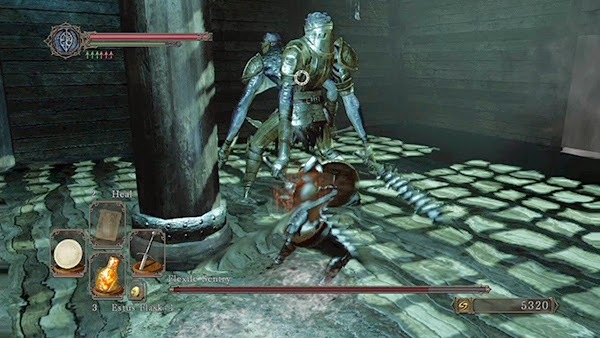 It's also worth noting that there are no repeat bosses this time around (f**k Asylum demon and his clones), and that each boss looks uniquely different. The bosses are very differently designed though, its a lot different than how bosses in previous games were designed. Will you fall to the quick wits of The Pursuer? Or to the slow, painful attacks of The Rotten? Bosses are a blasts as always, and they're an enjoyable feat. While we're at it, lets talk about the game's new interface. Everything looks cleaner, and the fact that pressing start no longer covers the entire f**king screen is great! Its much easier to scroll through items, and the fact that you no longer have to consume your souls one by one is just a godsend. Its also a lot less distracting when you discover new items as they don't take up half the screen. Of course, since opening the menu is slower this time, you can't just pop it in during a boss fight when you're losing and expect to quit the game in time. Speaking of the bosses, they are fairly varied this time around, with a focus on making the optional bosses harder, which I think is something they should have done a long time ago (f**king Ancient Dragon). What else can I say? 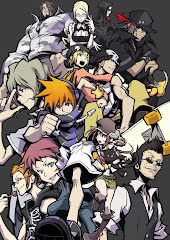 While the main flow of the game can be somewhat similar to that of the original, the game is significantly longer. The world is bigger this time around, and there's a lot of stuff to do. Though, whether or not you want to do it is another different story, because some of it can be rather tedious (Darklurker requires you to join the dark covenant). There is going to be a lot to do here is you're a completionist, so sticking around for greater finds can be quite entertaining. If I'm to have any issue with the game, its that there is a lot less lore or "story" surrounding Drangleic than Lordran in "Dark Souls". While you can still dig through item descriptions for story bits here and here, many of the bosses, areas or enemies lose that sense of identity that you want to discover from. Unlike in the original where Gwyn and the 4 soul lords killed the dragons, there isn't anything to start off here in "Dark Souls II", and honestly after a small few, you won't give a hitch to the story of many of the bosses. You'll probably only see them as targets to vanquish, nothing else. Its also worth noting that NPC quests are a lot less interesting or intriguing. Everything in this game, while fun, has less "Soul" in its lore. Overall "Dark Souls II" excels where it counts. Its a masterfully crafted sequel that excels technically and mechanically. Game play is addicting as hell, and with a multitude of different character builds to try, you'll almost never grow tired of "Dark Souls II", just like the games before it. Its safe to say the the franchise will keep on expanding, and if this is what they're capable of, I can't wait for an entry in the PS4/XBOX ONE era. 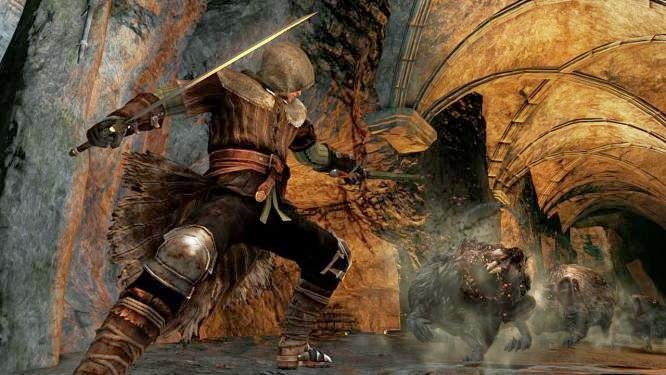 "Dark Souls II" is a mesmerizing adventure that'll gut you with deaths, over and over. For such is the nature of the "Souls" series.